Great Stuff at Aphrodite now! It’s time to give you an overview of some of the fabulous new products that have arrived lately. Plus we have some limited time specials starting with this one…. 2 for 1 or 30% off. 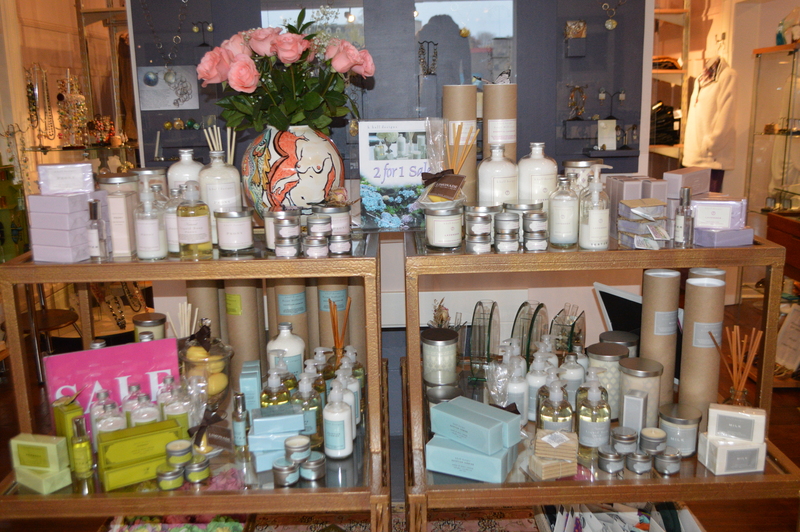 Enjoy our nice selection of K. Hall fragrance and bath products in five fragrances: Milk, Egyptian Jasmine, Lavender, Verbena and Peony. Lovely and luminous, their 100% vegetable wax blend candles have superior fragrance holding capabilities allowing aroma to radiate further. This blend is made from renewable sources and is grown by American Farmers. Cotton wick, hand poured in glass, with an aluminum cover or with a gift box. The exclusive formula of the liquid soap is moisture rich and deeply cleansing; great for your hands and body. The recipe is a blend of select vegetable oils, honey, and botanicals and has no petroleum or animal components. The generous two pound bottle of mineral bath salts looks stunning in any setting, but works and scents even better. K. hall reed diffusers are among the best anywhere using thicker reeds that saturate thoroughly, allowing the scent to disperse further. They use only the highest quality essential and fragrance oils. The hand lotion is packaged in a pretty gift box, and inside their special formula is made with 5% shea butter, aloe leaf juice, and other fine ingredients that give the cream its rich, moisturizing qualities. Their pure vegetable soap is enhanced with shea butter and olive oil known to moisturize and protect the skin. This half pound oversized bar is rich and creamy. Triple milled, this soap will last and last. By now, you are probably familiar with the superior style of Hue Leggings. We just received a shipment of their best seasonal designs including soft suedine, pleather, metallic snakeskin, herringbone with leather trim to name a few. Shop early while we still have a good selection of sizes and styles. They are priced from $35 to $60. Unbelievable! We also have all the new fall colours and patterns of tights that will streamline every fall outfit. The legging and skinny jean look continues to be super strong. Many of our customers have been asking what show goes best with that look. We tell them a sweet little ballet slipper or a sleek bootie are the best match – so this year we brought them in so you can pair up the perfect shoe for yourself. 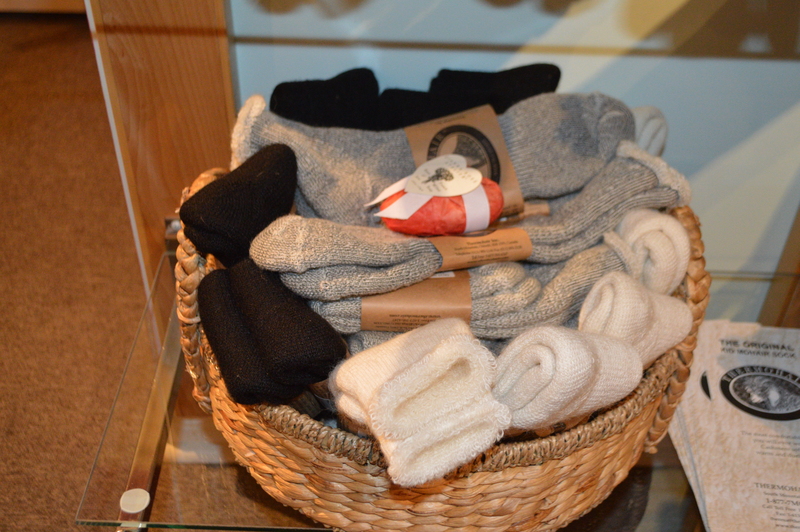 Happiness is warm feet – we found the most amazing Thermohair soft and cozy natural fibre socks – made in Canada. We have also enhanced our collection of colourful and happy socks – wonderful holiday gifts! Last winter we sold out early so this year we invested in a much larger selection of warm wear for your hands. 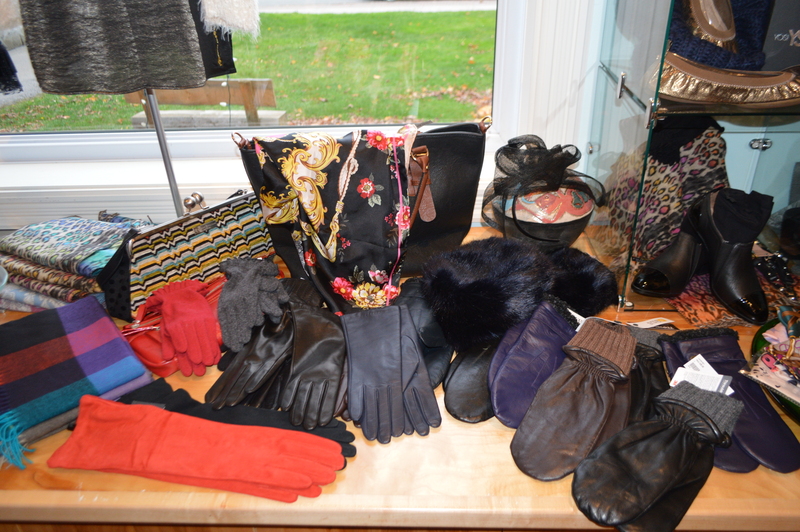 Select your ideal fall/winter gloves from our great selection in a variety of wool, suede and leather. All are well priced starting at less than $20. 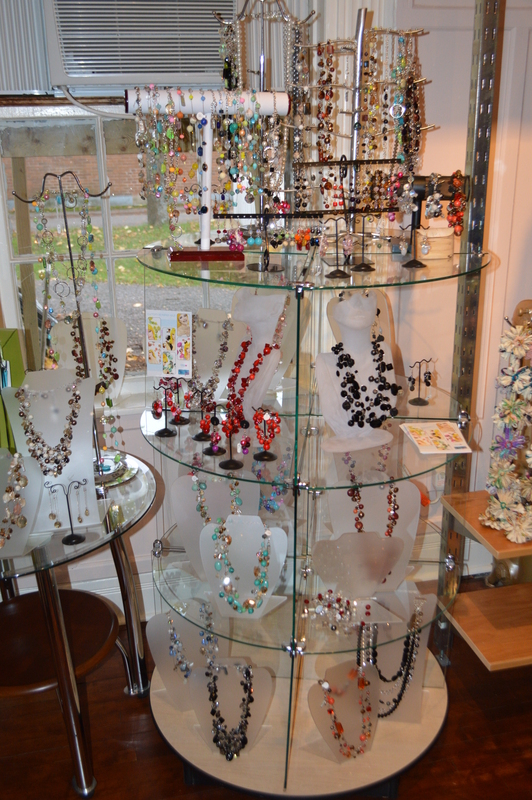 This glitzy little Canadian line of beads and baubles has been jazzing up our outfits since we opened. We’re giving you a little pre-Christmas deal on all Glamzulz. Plus we have some news to share on one of our designers…. Recently the Globe and Mail carried an article on one of our favourite designers – Jan Stimpson the creator of Sympli. We have received a new collection of Sympli in great shapes and colours for our Goddess Plus Boutique. Let us put a holiday outfit together for you that promises to turn heads. 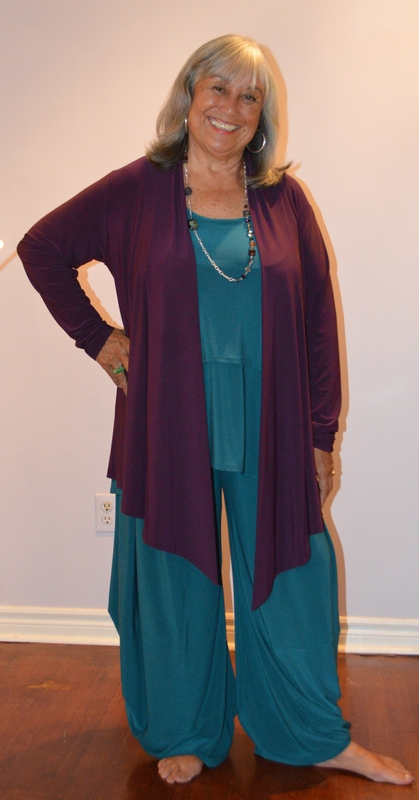 Like our friend Judith Luther Wilder who rocked this outfit. I haven’t heard back from you in regards to the red and black fur collar coat. I am definitely interested. I just need to know if the one I tried on last year was a size 8. Hi Laurie. Yes it was a size 8 – so sorry I thought I had written to you. All the best!